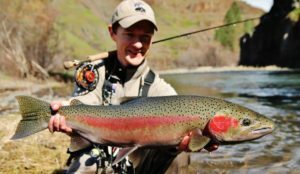 Description: Learn competition level nymphing from World Fly Fishing Championship Medalist Devin Olsen on the Middle Provo River. This class covers the case for European nymphing over other styles of nymphing, identifying target holding water, rigging European nymphing leaders, a simplified system for leader formulas, dry dropper hybrid rig, casts for European nymphing and common casting mistakes. The instructor will include floating or elevating the sighter upstream, the standard up-and-across presentation, and the down and across swing presentations. Devin will also discuss advanced techniques for landing fish.